Here we show where our artworks ultimately end up. On your wall off course and while we are at it we squeeze in some questions. 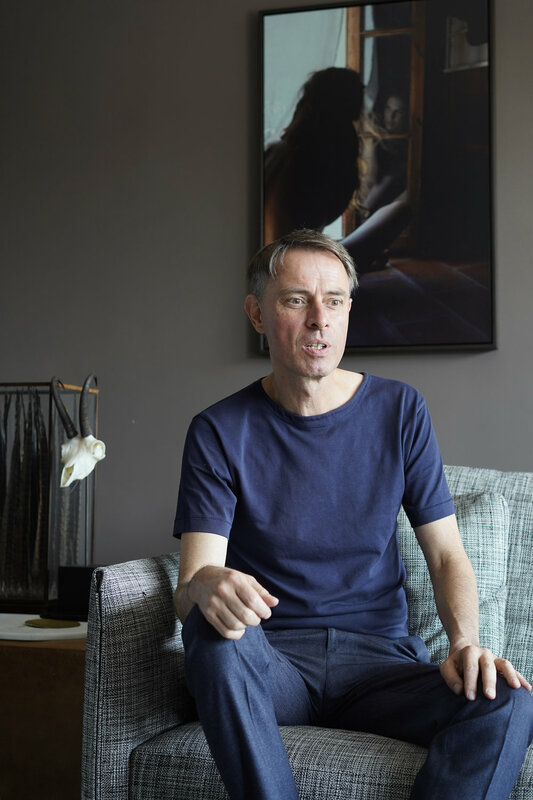 Roy Rietstap is one of the three founders of Amsterdam based book publisher MENDO. Together with his team he is responsible for releasing numerous coffee table books: Martin Garrix LIFE = CRAZY, Streets of Paris and of course or favorite #SENDNUDES. When we first set foot in Roy’s apartment our jaw dropped, we have not seen such a beautiful view over Prinseneiland (Amsterdam) before. Roy immediately fell in love with his top floor apartment twelve years ago and we get why. Here, on the spot where centuries earlier many shipyards and warehouses were established Roy created his own paradise. Not only photography, but images in general play a very important role in my life. Looking at images are equally present in both my private and proffesional routine. A home full of books, magazines and framed photographs. At MENDO. On my bike. On my phone. In galleries. You save. Forget. Tear out. Share and make pictures again. Get inspiration. Give inspiration. What attracted you to this specific work by Cayetano González? It’s an exciting picture. At first there does not seem to be much to see, but if you look further, the enormous splendor falls. It makes you wonder about her story, her nakedness feels natural and the beautiful forms attract attention. The colors, darkness and tension are in balance. When we asked Pavlik what it means to be an IT Engineer it was quitte difficult to keep up with all the terms and ICT slang: in short he ensures that we can safely transfer- and store our data in the cloud. His Amsterdam-based three story Manor-House is balancing a raw authenticity with a minimal approach through the reappropriation of salvaged materials. What we especially like in Pavlik’s interior are the contrasts. Present and past go hand in hand here. Photographs can grab my attention and speak directly to my emotions. Some artists can distill the mayhem and beauty that surrounds us. They call our attention to the things we overlook in our everyday lives. What attracted you to this specific work by Stefan Deyn? My living room felt a bit too sterile. I wanted to shake things up a bit. This work grabbed my attention. Although it is black and white, it is very striking and complements the rest of the interior.